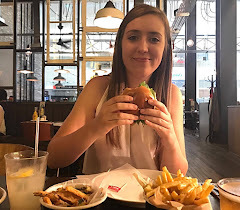 Last week, I was kindly invited to an event for bloggers at McDonalds in Clifton, Nottingham. The idea of the day was to learn a little more about McDonalds as a franchise and how they've evolved over the years. As a fan of a good Maccies every now and again, I jumped at the opportunity! Once everyone had arrived, we were introduced to Jerry who is the franchise owner of not only this restaurant, but 6 around the local area so is very well known in these parts and knows exactly what he's doing! He was accompanied by manager Claire who took us on a tour. First of all, we were introduced to the new self serve touch screen ordering kiosks which are located directly in front of you when you enter. Using these machines, you select the items that you wish to order and can be customised to be just the way you like it. For example, if you don't like sauce on your burger or salt on you fries, you can easily remove these on screen. You can even remove your fries from your meal completely and swap for a fruit bag. Although at the moment, you can not add additional items to your food e.g. extra cheese. We were told that this is something that McDonalds are currently looking into though. Throughout the process, you can see what you have ordered so far (in case you've forgotten) and can even use in different languages. I personally think they're a great idea and certainly take the stress out of ordering as you can process at your own speed. Once your order is complete, you select the zone in which you are sat (number can be found hanging from the ceiling) and your order will be bought over to your table once ready! Crazy - who would have thought that McDonalds would do table service!? So much better than standing around the tills waiting for you order. At the moment, the self service screens only accept card payments or Apple Pay. Another new feature within the restaurants are the tablets attached to the kids tables. A great way to keep the little ones entertained whilst having a meal and available to use completely free of charge. Don't worry, adults can use them too! Next up, it was time to head backstage. We were taken to the Crew Room (staff room) where we were provided with hats (with personalised name badges) and aprons. Well, we had to dress for the occasion didn't we!? No stars for me just yet. After transforming into a member of the crew, we were shown around the dry store cupboard where items such as sauces are kept, the walk in fridge for the fresh produce and walk in freezer where you find your meat patties. I will not be heading back in there in a hurry - it was so cold!! Out the back, we had a little chat about they way in which McDonalds recycle as much as they possibly can which even includes the cooking oil. It gets gathered up in a container and recycled into Bio-Diesel for the delivery trucks. Our tour then took us into the kitchen where were able to see all of the crew members hard at work. I couldn't believe how fast paced it is working in here. I know it's 'fast food' but I've never actually stopped to think about the guys cooking it all! They were all so calm, knew exactly what they needed to do and when which showed they'd all been trained really well. It was a great thing to see. Above you'll see the burger patties being cooked (from frozen). Did you know they are cooked in just 42 seconds? Now that is fast! Lots of efficiency. Then, it was our turn!! We were given the opportunity to make our own legendary Big Mac with a little help from assistant manager Tom. He went first, showing us all how it's done, then handed everything over to us (he did guide us all the way). McDonalds have a very strict procedure for constructing their burgers which absolutely must be followed at all times - even down to the weight of the shredded lettuce that you use. Something that seems a little harsh when you're first told that information, but you have to think about how important it is to maintain the same quality for the customer every time that they visit. If something is the slightest bit different to the usual, chances are, they aren't going to leave happy. Overall, I didn't think I did too bad! After our tour, we went back into the restaurant to eat some food for ourselves and have a chat about our time at the restaurant. It was great to be invited along to see the changes happening within McDonalds and how they are always on the look out to improve their service. Eventually, this will be the way that they all operate throughout the country, so keep an eye out for the introduction of these in your closest store. Whenever I visit McDonalds, it's for a drive through. I very rarely go inside. However, when I do, I'll be sure to give the self service a go for myself. Big thanks to all of the staff at McDonalds Clifton, you were great hosts! This blog post is sponsored however all opinions remain my own.